Half of the five-mile Kincraig to Dalraddy road will be restricted both ways to a single lane and 50mph speed limit for six weeks, with the whole route being affected for a two further weeks. Average speed cameras will also be in use. Work began last night to lay fibre optic cabling – known as Intelligent Transport Systems (ITS) – along the verges to connect with roadside electronic message boards along the busy trunk road. It comes just months after the stretch fully reopened following two years of dualling works. Badenoch and Strathspey councillor Bill Lobban described the decision to do the work during the busy tourist season as “ludicrous” and was astounded by what he says has been a lack of consultation on the timing of these works. He added: “This will go down very badly with the public. “We all appreciate these works have to be done, but why do them in the middle of summer? Why not in the spring or autumn when there are fewer cars and fewer tourists? The spokesman for the national transport agency said the ITS network was not installed in September, when the new dual carriageway opened, as it was “not critical” to its operation and it was decided to complete the works at a later date to prevent further delay to the road’s opening. And the spokesman said shorter days would be less productive, resulting in restrictions for a longer period and increasing disruption. But Mr Loban said these explanations were inadequate and reiterated his doubts over the Scottish Government’s estimated 2025 completion date for the £3billion dualling programme. Only the Kincraig to Dalraddy section has been finished so far, which represents just 6% of the 80 miles to be dualled. Construction is due to start on another section between Luncarty and Pass of Birnam in the coming months. 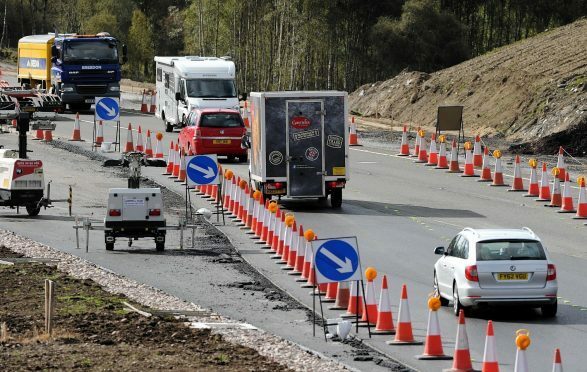 Transport Scotland previously said that many of the other dualling sections are being progressed simultaneously, allowing the 2025 date to be achieved. It is also understood that, during the eight weeks of works between Kincraig and Dalraddy, average speed cameras will be operating on parts of the road subject to the restricted 50mph speed limit. A 40mph speed limit was put in place and traffic was restricted to one lane in both directions when work started to dual the five-mile stretch in September 2015. A freedom of information request by The Press and Journal revealed that more than 1,800 motorists were caught speeding through the 40mph roadworks in the first three months for which data was available, with another 2,000 caught in the subsequent three months. It is expected that the new traffic management measures will be in place on the A9 from Kincraig to Dalraddy until about August 3. Information about the works have been communicated in the form of road-side signs, travel bulletins, and by Transport Scotland on social media.